The first gathering of the International Big History Association drew not only scholars of Big History but also educational project developers. As a longtime contributor to evolutionary education, I was eager to attend the panel sessions that focused on education. Below are clips from the photo essay I posted about some of the Big History educational sessions. Cynthia Stokes Brown (above left) introduces the “Cosmic Education and Big History” panelists. 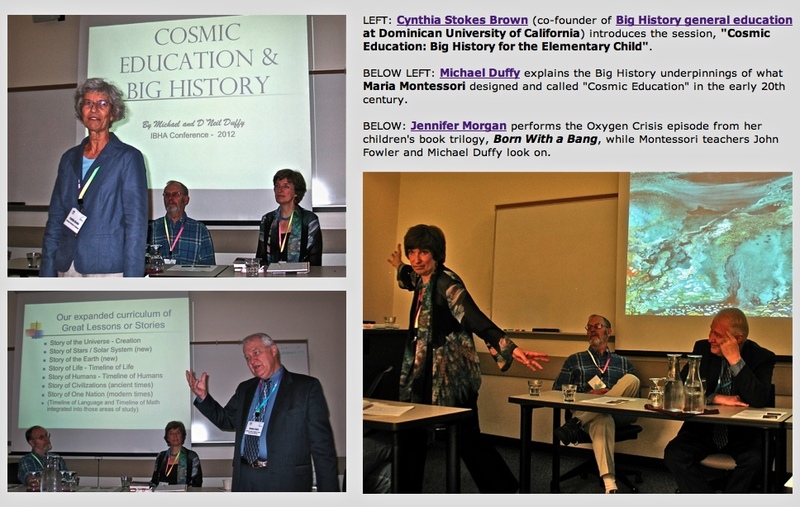 Michael Duffy (below left) sets Big History education in the context of Maria Montessori’s emphasis on “cosmic education” (which she developed early in the 20th century). Jennifer Morgan (right) dramatizes the Oxygen Crisis, drawn from her Born with a Bang children’s book trilogy. Geologist Walter Alvarez, co-discoverer of the meteor-impact geological evidence of the dinosaur extinction, signs the K/T boundary bead (right, initials “W A”) on the string of Big History beads fashioned by Big History enthusiast (and chemical engineer) Jon Cleland-Host. I serve as narrator of “The Lucky Little Seaweed” performance. At right are two volunteer readers, drawn from the plenary audience at the Big History gathering. The woman in the bright green scarf is the hero of this playful “Big History parable”: the Lucky Little Seaweed. The man in the brown scarf plays the villain: the Fungus. Together, they act out how, more than 400 million years ago, crisis led to creativity: Seaweed and fungus forged a cooperative life form that is the ancestor of today’s land plants. Scripts of a half-dozen such parables are downloadable here. And you can access my full photo essay here. 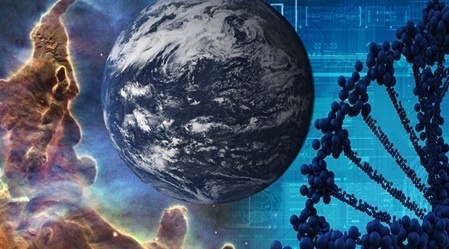 Is Evolution Just another Religion?